· ORIGINAL RED AND BLACK COLUMBIA 'SIX EYE' MONO LABEL WITHOUT SMALL 'CBS' LOGO ON TOP. · MONO version of this album has NEVER been available on legitimate Compact Disc or in any other digital format (ALTHOUGH IT WAS INCLUDED IN THE MILES DAVIS MONO BOX SET). 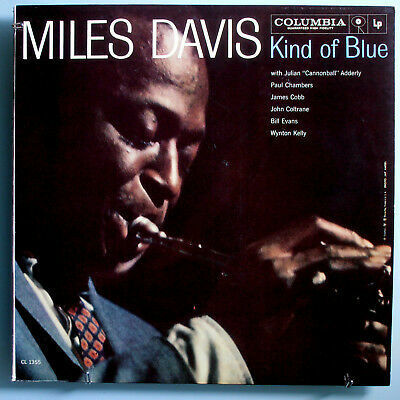 Kind of Blue isn't merely an artistic highlight for Miles Davis, it's an album that towers above its peers, a record generally considered as the definitive jazz album, a universally acknowledged standard of excellence. Why does Kind of Blue posses such a mystique? Perhaps because this music never flaunts its genius. It lures listeners in with the slow, luxurious bassline and gentle piano chords of "So What." From that moment on, the record never really changes pace -- each tune has a similar relaxed feel, as the music flows easily. Yet Kind of Blue is more than easy listening. It's the pinnacle of modal jazz -- tonality and solos build from the overall key, not chord changes, giving the music a subtly shifting quality. All of this doesn't quite explain why seasoned jazz fans return to this record even after they've memorized every nuance. They return because this is an exceptional band -- Miles, Coltrane, Bill Evans, Cannonball Adderley, Paul Chambers, Jimmy Cobb -- one of the greatest in history, playing at the peak of its power. As Evans said in the original liner notes for the record, the band did not play through any of these pieces prior to recording. Davis laid out the themes before the tape rolled, and then the band improvised. The end results were wondrous and still crackle with vitality. Kind of Blue works on many different levels. It can be played as background music, yet it amply rewards close listening. It is advanced music that is extraordinarily enjoyable. It may be a stretch to say that if you don't like Kind of Blue, you don't like jazz -- but it's hard to imagine it as anything other than a cornerstone of any jazz collection. What we have here is Jazz equivalent of the Grand Canyon. The album which, for the next four decades, pretty much defined everything that's spontaneous, improvisational , modal and otherwise genuine in music. This music truly has no equivalents, peers or points of reference in modern music, whether before or after its conception. Word has it that Duane Allman played nothing by "Kind of Blue" for many days and months on end, and the list of Jazz musicians profoundly affected by its spontaneity, mood, gentle blue tinge and supreme musical competence (to put it mildly) goes on and on and on. Plus, how many times do you get to hear the interplay between Miles Davis, John Coltrane, Bill Evans and Cannonball Adderley - all assembled in one place?. This is not music, this is pure aural ambrosia. The Jazz’ greatest album was beset from its inception by the mastering problems, and experts claim that it is off by a fraction of the scale, due to the fact that it was mastered at the wrong speed. The original, first analog pressings on six-eyes Columbia label are becoming extremely rare and extraordinarily coveted by practically everyone - jazz and non-jazz collectors alike. For any self-respecting Jazz aficionado, this is the only possible way to hear the greatest jazz album ever. (a) WE GRADE THE VINYL AS NEAR MINT. Some VERY LIGHT AND SUPERFICIAL abrasions – mostly sleeve scuffs - are (barely) visible, but are probably inaudible, and do not affect visual integrity or beauty of the vinyl. The original luster is very much intact, and the vinyl shines and sparkles almost like new. (b) The record comes in a hi-grade MFSL PVC inner sleeve, which has - apparently with success - shielded the record from the harmful impact of elements over many years! (c) The record has a "deep groove" (an indent in the label about 1/2-inch from the edge of the label, which on SOME labels is associated with very early or first pressings). (d) The record is pressed on a beautiful, thick, inflexible vinyl, which was usually used for the first or very early pressings. Usually, the sound on such thick vinyl pressings is full-bodied, vivid, and even dramatic. Do not expect to obtain such a majestic analog sound from a digital recording! (e) Of course, this is a full-bodied ANALOG recording, and not an inferior, digital recording!!! THE COVER IS NICE --- ABOUT EXCELLENT OR VERY GOOD+++. - Cover has JUST A HINT of ring wear (nothing significant); On the scale from 1 to 10 (1 being the least, and 10 being the most severe), we assess the severity of ring wear as 1.
INTERNATIONAL POSTAGE rates vary from country to country. For SPECIFIC international and domestic postage rates ►. While you can be rest assured that ►, please note that damage, loss or theft in transit is always possible, and in the case of some countries even PROBABLE. To discuss this potential problem and ensure flawless delivery, please contact us thru eBay BEFORE placing a bid. IT’S EASY: CLICK ► TO see HOW!